Do you need more kitchen storage? Are you on a budget? Is it not possible to tear down walls to add more space? We have 11 tips, to get even the tiniest of kitchens to accommodate your needs! Multiple-shelf units, which vary by manufacturer, are engineering marvels for standard front-access cabinets. When you open the door, the shelves directly behind it pull out automatically. The back section, normally housed in the corner, moves into view. You also can pull out those shelves to gain easy access to what’s in the back. The space under the kitchen sink is a challenge. So many plumbing parts are in the way that it often becomes a dark cave. Look to tilting drawers, door racks, stacking shelves, and plastic buckets filled with cleaning supplies to bring order to your cabinet. Deciding how to store dishes and glassware isn’t an either/or proposition. You can combine several approaches and use them as part of your decorating scheme. Simple shelves can hold plates and bowls, while cups hang from hooks on a rail. Glasses and other dishes are kept behind glass doors. If you reserve the walls of your kitchen for windows or artwork, you may decide to store dishes in drawers. Sturdy wooden pegs, secured into holes in the base piece, keep dishes from knocking against each other every time you open or close the drawer. 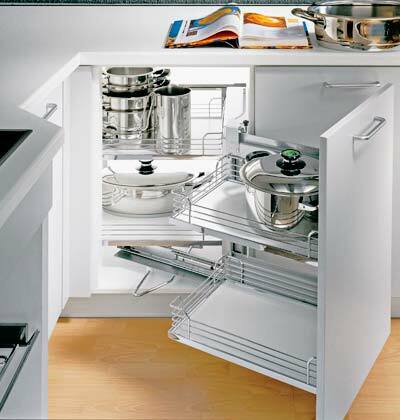 If you have drawers that are custom sizes, look for adjustable silverware organizers. You also can find drawer dividers made of plastic and cut them to size with scissors. Piggybacking two drawers in the space of one allows you to keep different sets of silverware in one section and meal-preparation tools in the other. If your silverware has oversized handles or if you have numerous pieces, look for drawer organizers with deep bins, or outfit the drawer with bread pans or other suitable containers. To store wooden spoons and other frequently used cooking tools, one of the easiest solutions also works best: Stash them in a wide canister that you leave next to the stove. A narrow pullout knife rack can fit between cabinets. This space is often covered over with a filler strip rather than used for storage. In homes with no small children, knives can be stored in kitchen drawers.